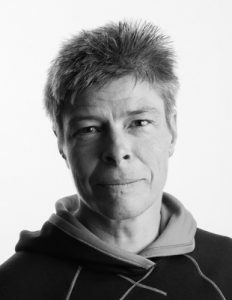 I’m delighted to welcome Marie Gameson to my blog today to talk a little about her fascinating new book, The Giddy Career of Mr Gadd (deceased). “Winifred is exasperated by her Catholic mother’s inability to accept her conversion to Buddhism, and by her family’s determination to drag her back to her former life. But when an elderly stranger – haunted by his dead father – turns up on Winnie’s doorstep, insisting that stories she wrote as a teenager hold the key to his supernatural problems, Winnie is forced to renew acquaintance with her younger self. The Giddy Career of Mr Gadd (deceased) does have lots of humour, but the main theme is grief – not so much grief for the dead as for the living. The main character, Winnie Rigby, is exasperated that her conversion to Buddhism and attachment to the Orient are strongly resisted by her Catholic family, who make persistent attempts to remind her of the person she used to be. I wrote this book to explore an issue which has long bothered me, and more so recently: how do you cope when someone close to you has substantially changed? The reason could be because they have had some physical or mental trauma, joined a cult, become an addict, or simply because they have adopted a new political or spiritual belief system. Of course, in the case of the latter, the grieved-for person can be annoyingly positive about the change; most of us have come across a new zealot, and have good reason to avoid ‘born-again Christians’, or ‘born-again anythings’. But whatever the reason for someone changing, that person is still alive, still looks pretty much the same, and yet is no longer the person you remember. 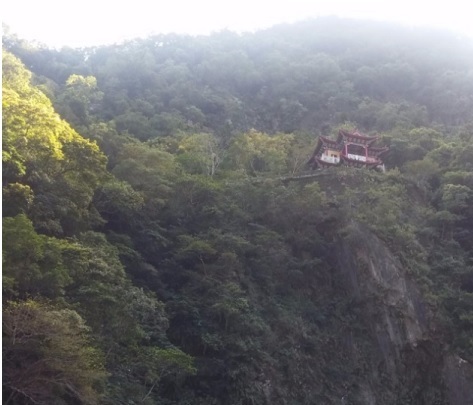 In the case of Winnie Rigby, after practising Zen Buddhism for some years, she had an enlightening experience whilst on a mountain in Taiwan, which increased her resolve to further her practice. Since being forced back to the UK by her family, she feels alienated and out of touch with her old life; in fact neither her old neighbourhood nor her old acquaintances seem familiar, which is inconvenient, as people who insist they know her turn up with irritating frequency. Consequently, her only objective is to get back to Taiwan just as soon as she can figure out how to replace the funds that have mysteriously disappeared from her account – (on her instructions according to the Bank) – but which seem to have gone to a cause that sounds suspiciously close to her mother’s heart. Winnie’s refusal to return to her former persona or to traipse through pointless memories is challenged when an elderly man turns up on her doorstep, haunted by his dead father’s restless spirit, and insisting that the younger Winnie knew something about this late Mr Gadd. Although Winnie has no time for ghosts or superstition, when she is given proof that she did indeed write about Mr Gadd, she reluctantly agrees to try and find out why she wrote about a man who not only died years before she was born, but whose afterlife she seems to have recorded. But the more she remembers, the more the answers seem to lie in the East. In her search for the elusive Mr Gadd, Winnie may fulfil her wish to return to the Orient – but unravelling the mystery of Gadd is bringing another unexpected revelation. But with that little whinge out the way, the book has been a wonderful journey for me in terms of trying to reconcile East and West. 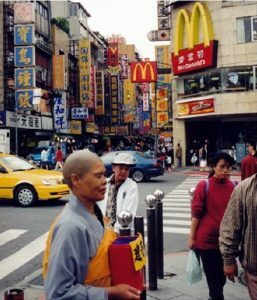 Whether they are truly reconcilable or not, I will finish with a photograph I took some years back in Taipei of a Buddhist nun begging for alms. I rather like it. Many thanks for visiting today Marie. This sounds like a fantastic read. A really interesting post by Marie, Jenny – it’s a very intriguing premise for a novel!